Wade Marynowsky, Mark Booth, Chris Bowman, Mark Brown, Claire Healy and Sean Cordeiro, Louisa Dawson, Gary Deirmendjian, Judith Duquemin, Allan Giddy, John Gillies, Locust Jones, Akira Kamada, Michael Keighery, Daniel Mudie Cunningham, Meredith Peach, Jane Theau, Rachel Walls, Ken and Julia Yonetani. Mining Pyrite is a NEW exhibition to be displayed for FREE at Newington Armory Gallery at Sydney Olympic Park, from 10am-4pm every weekend from Saturday 17 June – Sunday 20 August 2017 (inclusive). Curated by Cassandra Hard-Lawrie and Nick Vickers, Mining Pyrite will feature the works of 20 international and local contemporary artists, each of whom have drawn inspiration from Sydney Olympic Park and used its facilities to create their artworks. The diverse exhibition spans a broad range of expressive media forms including installation, sculpture, photography, multimedia, video, painting and more. Gaining its title from the mineral ‘pyrite’, or ‘Fools Gold’, Mining Pyrite explores the parallel narrative of failure and success that can be drawn from the ‘artist's’ story. Curator Nick Vickers draws comparison between the development of Sydney Olympic Park and that of the artist’s journey. “The constant testing and exploration of the boundaries of what does and doesn’t work is the stock and trade of creativity," explains Vickers. During the past 12 years, Sydney Olympic Park Authority has supported more than 170 artists' journeys of exploration by providing its artists-in-residence program. The program allows artists to take inspiration on-site of the historic, heritage-listed Newington Armory precinct, via its unique studio spaces available for rent to artists. Mining Pyrite features the works of artists who have occupied the studios at Newington Armory and whose works exemplify a journey of exploration and experimentation. 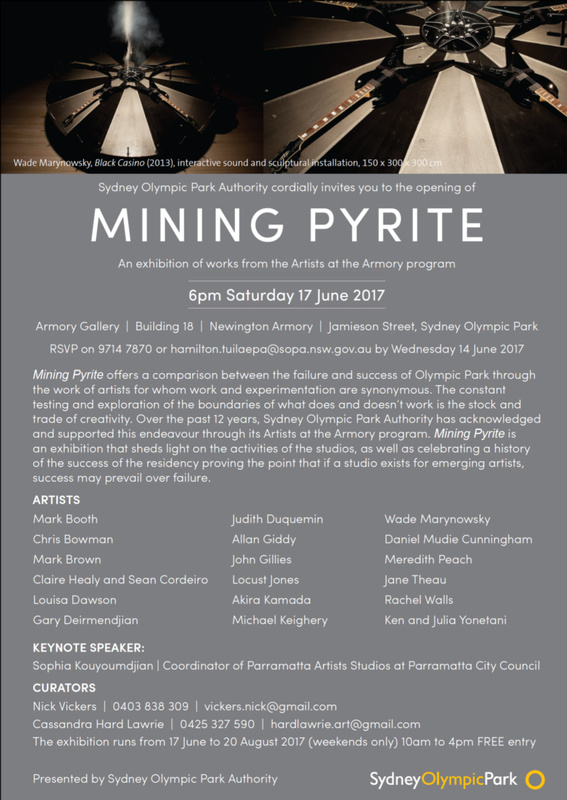 The Mining Pyrite exhibition sheds light on the activities of the studios at Newington Armory, while celebrating the success of the Park's artists-in-residence program and the history of Sydney Olympic Park as a whole. The area that is Sydney Olympic Park today has experienced many instances of failure and success. From the closure of its State Abattoir in 1988 and the Brickworks closure thereafter, the area was then considered economically unviable. The Park hosted numerous unsuccessful coal mining attempts and was once a wasteland. Today however, Sydney Olympic Park is recognised as an internationally admired example of sustainable urban renewal and development. The Park is home to a growing residential area with a thriving corporate business district and a spectacular entertainment precinct. Featured artist Wade Marynowsky specialises in immersive, interactive and experimental art forms. Mining Pyrite will include his work Black Casino, which involves five flying V guitars mounted atop a rotating spin wheel, his boundary-pushing style acts as a fitting parallel to Sydney Olympic Park’s own progressive journey. “The arts community of Western Sydney is second to none and the ‘Mining Pyrite’ exhibition at the Armory Gallery provides a great opportunity to see a sample of some of the region’s best artistic works,” said Minister for Western Sydney, Stuart Ayres. “I recommend people get along to Sydney Olympic Park’s Armory Gallery and enjoy exploring this unique arts space”. Mining Pyrite features the artworks of: Wade Marynowsky, Mark Booth, Chris Bowman, Mark Brown, Claire Healy and Sean Cordeiro, Louisa Dawson, Gary Deirmendjian, Judith Duquemin, Allan Giddy, John Gillies, Locust Jones, Akira Kamada, Michael Keighery, Daniel Mudie Cunningham, Meredith Peach, Jane Theau, Rachel Walls, Ken and Julia Yonetani. With nearby FREE car parking at Blaxland Riverside Park, the Armory Gallery is located at Building 18 at Newington Armory, accessible via Jamieson St at Sydney Olympic Park. For more information, visit sydneyolympicpark.com.au/arts. Also, check-out Sydney Olympic Park’s YouTube Channel, follow @olympicpark_syd on Twitter and @SydOlympicPark on Instagram or visit the Sydney Olympic Park page on Facebook. * When: Every weekend from Saturday 17 June – Sunday 20 August 2017, 10am – 4pm. Original Image for Formal Garden - Digital Image. La collettiva di pittura, scultura, installazione e video vede la partecipazione di artiste provenienti da tutto il mondo: Europa, Usa, Venezuela, Turchia, Colombia, South Africa, Australia, differenti per cultura, religione, territorio. Unite insieme dalla regia di Dores Sacquegna che le ha selezionate per il loro apporto espressivo. a cura di Dores Sacquegna. Un evento patrocinato dall’Assessorato alla Cultura del Comune di Lecce, una manifestazione tutta al femminile per Itinerario Rosa, (ad oggi la 14° edizione) volta a valorizzare il ruolo sociale e culturale della donna attraverso una serie di iniziative culturali e artistiche, utilizzando contesti di grande pregio storico ed architettonico della città e coinvolgendo le associazioni femminili operanti sul territorio. Come ogni anno, per diverse settimane nel corso della prossima primavera (anche in coincidenza della Festa della Donna), numerosi “percorsi al femminile” caratterizzeranno l’offerta culturale, sociale ed artistica dell’amministrazione comunale. Primo Piano LivinGallery, annualmente dedica un evento di respiro internazionale, alle artiste donne, per promuovere un dialogo interdisciplinare (che coinvolge arti visive e spettacolo). Il progetto di mostra di quest’anno dal titolo “L’essenza di tutte le cose”, è rivolto a scandagliare in maniera approfondita la capacità creativa delle donne artiste, attraverso una mostra che mette in luce concetti, simboli, archetipi, e caratteri del proprio viver quotidiano in stretta relazione con il mondo in cui si vive. Per l’evento, è previsto l’installazione-performance “Goods gone bad” di Massimiliano Manieri con le “Infiltrazioni sonore” di Giorgia Santoro. L’installazione di Manieri è composta da una sorta di igloo, un rifugio costruito con oltre cinquecento barattoli di pomodoro, assemblati gli uni con gli altri a forma di cupola, dove i visitatori saranno invitati ad entrare seguendo “il pifferaio magico” delle infiltrazioni sonore di Giorgia Santoro. Un contenitore che diventa contenuto e che rappresenta lo status symbol del mondo contemporaneo. 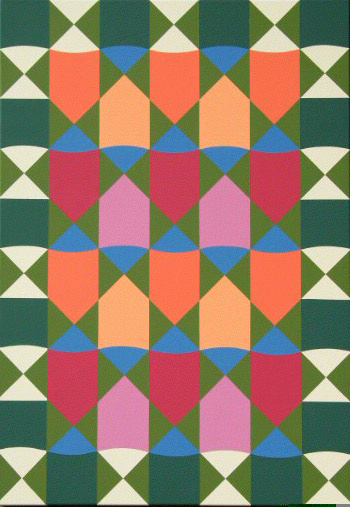 La mostra di pittura, scultura, installazione e video vede la partecipazione di artiste provenienti da tutto il mondo: Europa, Usa, Venezuela, Turchia, Colombia, South Africa, Australia, differenti per cultura, religione, territorio. Unite insieme dalla regia/cura di Dores Sacquegna che le ha selezionate per il loro apporto espressivo. E così nelle prestigiose sale della Primo Piano LivinGallery, l’arte si manifesta nella sua essenza più vera, facendo emergere colori, forme, suoni, visioni, sensazioni e facendole interagire con il pubblico astante. Arte come cultura di una società che si evolve, arte come comunione di intenti e dialogo tra le parti, arte come momento sociale e significato. Dall’inafferrabile (scultura interattiva) di Ezia Mitolo, al video “Private Conversation VI” di Elisa Laraia, dalla scultura sull’”origine del mondo” di Maria Luisa Imperiali alla “Godness Mother” di Asli Kutlay, dalla “Femme Guerriera” di Katelyne Ostyn, ai “Dervisci danzanti” di Emine Tokmakkaya, dagli “origami” di Wendy Roach al “formal garden” di Judith Duquemin e così via..
Un’arte tutta al femminile che porta in mostra l’essenza di tutte le cose. ARTISTE: Pat Arnao (Usa), Anne Desfour (Francia), Judith Duquemin (Australia), Sarazen Haile (Usa), Asli Kutlay (Turchia), Maria Luisa Imperiali (Milano), Elisa Laraia (Potenza), Marisa Manuzzato (Venezuela), Adriana Marmorek Arango (Colombia), Ezia Mitolo (Taranto), Barbara Neulinger(Usa), Katarina Norling (Svezia), Katelyne Ostyn (Francia), Wendy Roach (Usa) Nadine Rolland (Francia), Meltem Soylemez (Turchia), Emine Tokmakkaya (Turchia), Marna van Heerden (South Africa).